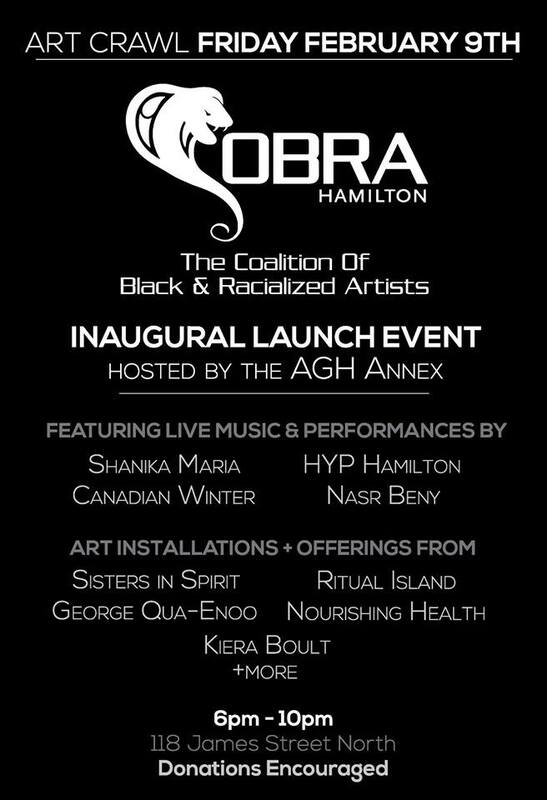 COBRA is a Hamilton-based collective of artists of colour. It has come to our attention that artists of colour are under-represented, both at the grassroots and administrative levels; we seek to offer our perspective as the Hamilton Arts Community begins making strides towards a more complete understanding of the city’s under-served artistic scenes. Observing a lack in opportunity for non-white artists, the idea for COBRA took shape in 2016 as artists from diverse racial backgrounds – photographers, musicians, playwrights, visual artists, designers – began discussing the challenges they collectively experienced as a racialized community. These artists have all contributed in major ways to Hamilton’s artistic scenes and are considerable components in the growth and popularity of Hamilton’s art and culture (which is now a selling point in drawing people to the city).